This breaded deep fried pastry with savory ingredients, will always be a crowd favorite. Never miss this for your main snacks offering. Add liquid milk, wheat flour, chicken eggs, Knorr Chicken Powder, and Margarine. Stir evenly. Pour 1 spoon of risoles to the pre-heated pan. Form the mixture on medium heat. Prepare the skin of risol. Then pour half a spoon of Mayo Magic, pieces of boiled eggs and pieces of smoked beef. Fold it into a risol shape with egg white as an adhesive. Dip risol into egg white, then coat with bread flour. Heat cooking oil and fried risol until cooked. 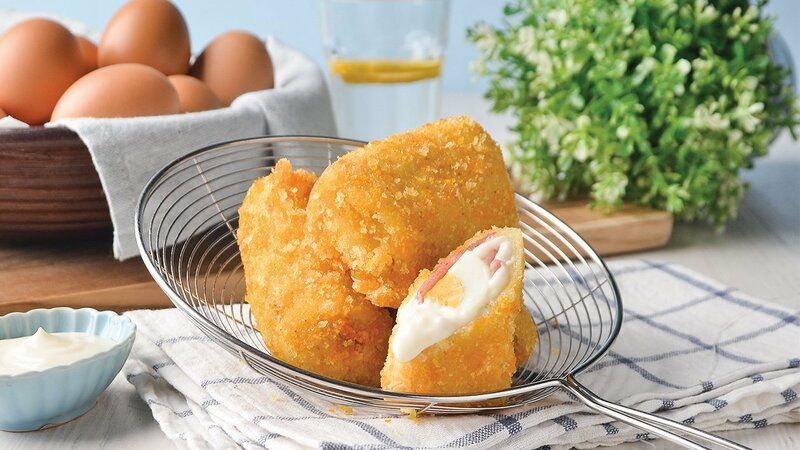 Risoles Mayonnaise is ready to be served.